These little bundles stuffed with meat, vegetables or shrimp are my favorite Asian food. I can have them steamed, fried, boiled, in soup, with dips, for breakfast, lunch or dinner. A restaurant devoted only to those parcels of joy would be my ultimate dining heaven. Toss in Vietnamese fresh spring rolls, Chinese dim sum and Japanese gyoza and I will move to live there, wherever it might be. 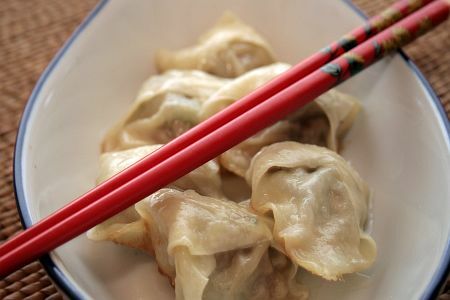 For years I was deprived of Asian dumplings and had to do with Polish pierogi (not that I don’t like them) and the occasional tired won ton or pot sticker in some mediocre eatery in Warsaw. I would have loved to make them myself, but the ingredients were hard to get, and it looked a bit too complicated. Well, not any more. The Asian stores in Chicago are amazing and once I found them my won ton obsession blossomed once more. With frozen pastry for all kinds of wraps and rolls, exotic herbs, vegetables and fresh shrimp cheaper than a pound of nuts, I was indeed in dumpling heaven. And it all was in my own kitchen. The best won ton wrappers I have found so far are Dynasty brand – 3.5X3.5 inch (8X8 cm) in about 12 oz (340 g) packs. As for spring rolls – I use Spring Home brand Tyj spring roll pastry – also frozen 5.5X5.5 inch (14X14 cm), 50 sheets. Those come with very helpful picture instructions on how to proceed. As for the filling – the sky is the limit. The best meat is fresh minced pork that is well marbled (lean is no good – it will be too dry once cooked). Napa cabbage, been sprouts, cilantro (coriander), Asian mint and basil can add a brighter flavor. My kids love rolling spring rolls and fight over the limited counter space. I’m always amazed by the quantities they can eat in one sitting, and all that without complaining about the weird greens. Won tons are also on their favorite list, though they yet have to master the wrapping technique. It took me almost an hour the first time I made them, but now I’m pretty good, though not yet as good as an Asian chef. 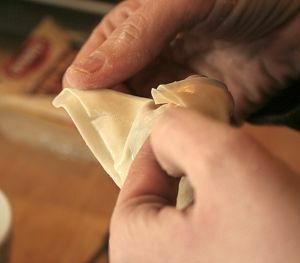 As with any other dumplings, once you get to it it’s better to make at least a double batch and freeze the extras, as you’ll probably have your fill of stuffing, folding and shaping for some time. In a bowl combine all the ingredients and mix well. On a clean surface place one wrapper. Spoon 1 teaspoonful of the mixture in the middle. Brush all the edges with water. Fold in half to form a triangle. 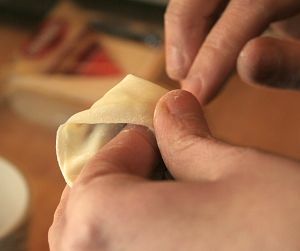 Starting from the filling, squeeze the air out gently by brushing with your fingers towards the edges, then press to seal the won ton. There, your won ton is ready. Place on baking sheet covered with parchment paper to prevent the dumplings form sticking to each other. Repeat with the rest. The first few will be hard, but once you get it, it’ll be easier. 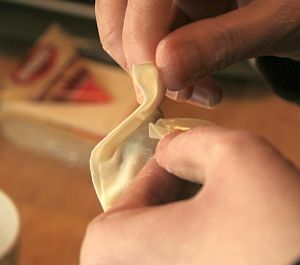 Don’t overlap the won tons on the sheet and be careful to dry your hands and work surface – the wrappers get sticky when wet and they are hard to take back apart. You can make this few hours before cooking. Cover with foil and let stand at room temperature. Count the amount you will need and freeze the rest on a metal sheet, then transfer to freezer bags or containers. When needed take them out and lay on flat surface for at least an hour. Use in aromatic clear Thai soup or fry and serve with your favorite dipping sauce. 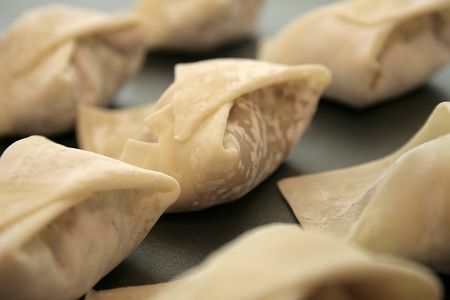 Heat a large frying pan over medium heat with ½ cup (125 ml) water and 2 tbsp vegetable oil for each 16 dumplings. Cover and cook for 6-8 min. They should be cooked through and have brown crispy bottoms. This is the side you should be serving them on. The taste explosion when you bite one is tremendous. They are great dipped in Chinese black vinegar or soy sauce, but I like to complicate things. My favorite is Vietnamese soy sauce recipe given by Trieu Thi Choi and Marcel Isaak in their Authentic Recipes from Vietnam. Combine everything in a bowl and mix well.